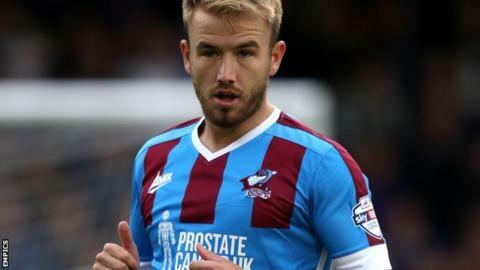 Paddy Madden's late strike saw Scunthorpe United beat high-flying Coventry City to earn a second League One win of the season. Madden pounced on John Fleck's mistake to steer a shot into the bottom corner. The Iron dominated as Lee Burge saved well from Gary McSheffrey's free-kick, and Ruben Lameiras headed Jack King's flick off the line. Scunthorpe had two ex-Coventry players in their ranks, Jordan Clarke and Gary McSheffrey, while Iron boss Mark Robins had five months in charge of the Sky Blues before quitting in February 2013 to join Huddersfield. City offered little until late, Romain Vincelot heading their best chance just wide from Sam Ricketts' cross. Coventry drop two places to fourth after their second successive away defeat, while Scunthorpe climb to 16th after their first win in six matches. "We totally deserved it. We've worked all week on what we can do to hurt them and picked an attacking side. We were outstanding and the supporters were outstanding. It was a really good feeling in the ground. "I am absolutely delighted we've got a clean sheet and absolutely delighted we've managed to convert one of the many chances we've had. We created loads, and loads of decent opportunities. "It's been a long time in coming. The longer the results don't come the more the pressure is heaped on the players, and the more they feel it." "It was disappointing in a lot of aspects. It looked like a 0-0 for long spells. If you paid your money to come and watch, you weren't getting your money's worth. "Scunthorpe worked very hard, closed us down and tried to stop us playing. They didn't cause us too many problems, but ultimately it only takes one chance to win a football match. "The disappointment is that, with the ball, we generally weren't good enough - which hasn't been a problem before." Match ends, Scunthorpe United 1, Coventry City 0. Second Half ends, Scunthorpe United 1, Coventry City 0. Corner, Coventry City. Conceded by Murray Wallace. David Syers (Scunthorpe United) wins a free kick on the right wing. Attempt missed. Romain Vincelot (Coventry City) header from the centre of the box is close, but misses to the right. Substitution, Coventry City. George Thomas replaces Marcus Tudgay. Marcus Tudgay (Coventry City) wins a free kick on the right wing. Murray Wallace (Scunthorpe United) is shown the yellow card. Gary McSheffrey (Scunthorpe United) wins a free kick in the attacking half. Attempt missed. Ryan Kent (Coventry City) left footed shot from outside the box is high and wide to the left. Marc-Antoine Fortuné (Coventry City) wins a free kick in the defensive half. Goal! Scunthorpe United 1, Coventry City 0. Paddy Madden (Scunthorpe United) right footed shot from the centre of the box to the bottom left corner. Assisted by Jordan Clarke. Adam Armstrong (Coventry City) is shown the yellow card. Jack King (Scunthorpe United) wins a free kick in the defensive half. Attempt missed. Ryan Kent (Coventry City) right footed shot from outside the box is high and wide to the right. Corner, Coventry City. Conceded by Scott Laird. Corner, Coventry City. Conceded by Jordan Clarke. Corner, Scunthorpe United. Conceded by Romain Vincelot. Corner, Scunthorpe United. Conceded by John Fleck. Murray Wallace (Scunthorpe United) wins a free kick on the right wing. Substitution, Coventry City. Marc-Antoine Fortuné replaces Ruben Lameiras. Substitution, Scunthorpe United. Darius Henderson replaces Tom Hopper. Substitution, Scunthorpe United. David Syers replaces Kevin van Veen. Substitution, Scunthorpe United. Sean McAllister replaces Jamie Ness.